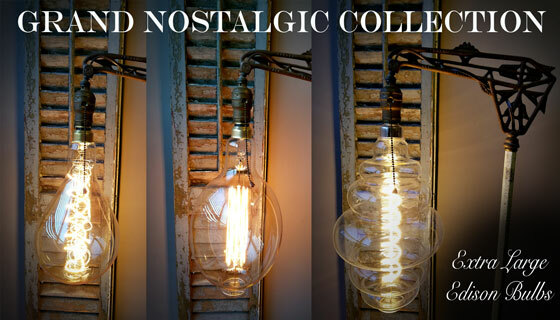 Brand New XL Edison Bulbs, 5 unique shapes inspired by our natural environment. Worlds Biggest Edison Bulbs- Standard sized light bulb screw base! From 12" to 15" tall, these bulbs are sure to become the focal point of any room, like nothing you've ever seen before! Available in three shapes in both LED and Incandescent versions, check them out now! Beautiful metal shades, a color and style for every space, now available! and small appliance restorations and DIY creations. Featuring over 70 varieties of cloth covered electrical cord, the BEST quality on the market. Worldwide shipping, fast order processing direct from our USA shop (no middle men or drop shipping to wait for). FREE shipping for US orders over $65. Accepting all major forms of payment (credit/debit), PayPal, Amazon Pay, Apple Pay, etc. Browse our parts using the "Shop By Category" section in the top left. Connect with us on Facebook, Instagram or Twitter, and sign up for our Newsletter where we'll send occasional updates of new products and promotions (about 1 email per month). Email signup is in the left column, or at checkout.